So here we are again in this oh-so-familiar place… I’ve been aching to get back to my blog, but avoiding it like that friend you really should have called months ago, and the longer you wait, the more awkward it gets, and eventually you just have to pick up the damned phone, or log into the damned site. So here I am. Not gonna apologize to myself or anyone else, cuz holy crap has life been topsy-turvy, and hey, I’m still here. So. 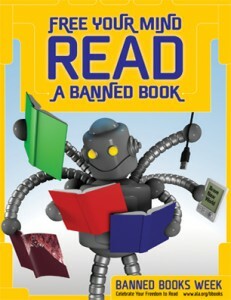 Banned books. Last year, I read Slaughterhouse-Five and To Kill a Mockingbird for the first time each and enjoyed both immensely; this year so far, I’ve finished Fahrenheit 451 and am currently working on Roll of Thunder, Hear My Cry, with One Flew Over the Cuckoo’s Nest on tap. I chose these by scanning my personal library for titles I’d never read that appear on the ALA Top 100 Banned/Challenged books: 2000 – 2009 list. I have no intention of reading every book on the list, but there are several I’ve been meaning to get to for years, and this is as good a prompt as any! Pretty brilliantly summed up, in my opinion. In other news, my brother and I are doing well; school is back in session, new routines are falling into place, and we’re enjoying a lovely late summer. Hope you out there in book blogger land are doing splendidly, as well! This came from my BookBlips daily radar; while it’s sometimes overwhelming in quantity, I’m grateful for the news and new blogs I find through the feed. Clearly, this is more about raising a stink than actually seeking to censor the author; the only effect it has had on me is adding one more book to my wish list, and causing me to seethe with indignation at the gall of some individuals. Thankfully, the folks who support censorship never seem to learn that by deeming a book unfit for children (or adults, for that matter), they often only succeed in giving it huge media attention resulting in a sales spike for the offending work. Which is just fine by me.